What are managed services and why would you need them anyway? What is a Managed Service Provider and how do they differ from a traditional IT provider? 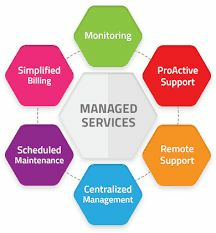 If you recognise any of the issues below it's probably time you considered how managed services could improve your business. IT issues crop up from time to time, but not to worry, your IT provider has this all in hand so it won’t disrupt your business. No? If your business is suffering recurrent IT issues which are taking time to fix, alarm bells should be ringing, loudly. A good Managed Service provider will have all the latest tools and technologies to sort things out before they turn nasty. They will not only be able to detect and solve problems normally before you’ve noticed, but they will also prevent them from happening again. Your call is always important to us! So whether its user error or a glitch in the system, if something does go wrong, you want the problem addressed quickly. If your IT provider’s response-time is slow, the downtime is wasting your time and money. Once you have logged an IT support request a qualified Managed Service Provider will respond to you quickly, providing clear timelines of when you can expect a resolution to your IT problem. Although you don’t work around clock (sometimes it feels like it), your network definitely does, and so does your Managed Service Provider. A reliable IT provider will have a solid monitoring solution in place, able to cope with any unwelcome surprises that may pop up at any time of the day or night, probably before you’ve even noticed anything is wrong. If you can’t be sure that this is the level of service you have in place, you should be looking for a new managed service provider. Data is the lifeblood of any business. Think about how long your business could afford to be without your key systems and data, a week, a day, an hour? Data backup is a good start, but what if the systems that you need them to work on are also down. A good Managed Service Provider will find out how long you can be without your critical systems and data, and then create a disaster recovery plan to make sure they can be restored and working before it gets critical. If you’re settling for less than this level of service, you need to ask yourself whether you are properly protected. The bigger you get the more complex your IT needs become as well as your reliance on technology to work first time, every time. A professional Managed Service Provider will be able to provide you with the IT support you need as well as the guidance to make sure your IT is working as hard as you are. The good news is that being stuck with the wrong IT Provider isn’t a life sentence. If you are worried that you are not getting what you paid for or your IT Provider isn’t able to keep up, make the switch. With so much riding on the reliability and security of your technology it could be one of the smartest business decisions you ever have to make. Find out more about NCC ITS’ managed services and how they can help your business by calling us 028 3026 5600 or by sending an online enquiry.